Fifteen years ago today, as I laid on a stainless steel operating table being prepped for my emergency C-section, the busy doctor and nurses patted my legs and feet as they walked past. Their gestures, meant to calm and reassure me, worked. Then, within minutes, I fell under the spell of general anesthesia. Sometime later in a different room, I awoke in a haze, Michael beside me holding my hand. I felt a dull throb in my lower back and the ache of fresh incisions and sutures in my belly. As I looked around at the blurry world, my newborn was nowhere to be seen. Slurring my words, I alerted Michael of my pain. Instinctively, he launched into our hypnobirthing script, which worked to dull the pain and lulled me back to sleep again. Later the next morning, I emerged from a morphine fog, eager to meet our son. Gradually, I sat up, careful not to pop the staples and stitches in my gut. I placed my feet on the waxed linoleum floor and gingerly lowered myself into the wheelchair Michael had fetched. He wheeled me down wide corridors and into an elevator which took us downstairs to the neonatal intensive care unit (NICU). Somewhere in the florescent-lit room, Calvin was sleeping in a clear plastic box called an isolette, the intubation apparatus that had assisted his frail lungs having recently been removed. We scrubbed our hands and forearms with soap and warm water, then donned paper masks before entering the room. As we neared our son's station—unsettling bells and alarms ringing and buzzing periodically—we passed by several other isolettes, each housing its own tiny baby, some no bigger than my hand and weighing little more than a pound or two. 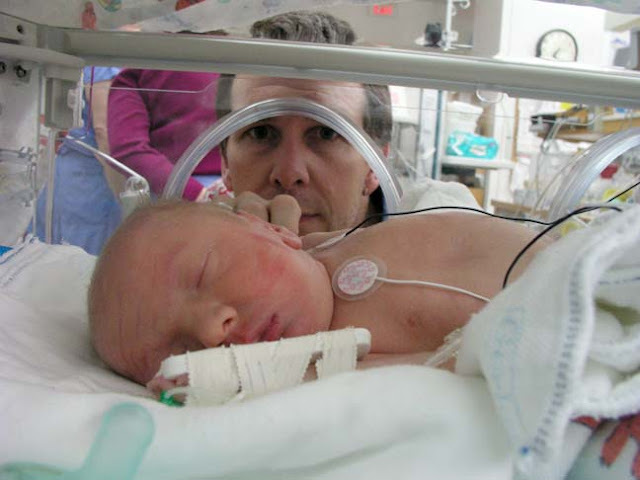 All of the preemies wore adhesive leads to monitor their heartbeat, respiration and oxygen saturation, and most were hooked up with cumbersome breathing tubes. When we reached Calvin's isolette, I recognized him instantly. His moon-shaped face had red marks where tubes had been taped, and a tiny little furrowed brow told me he'd been stressed. His right hand and wrist were taped with a splint meant to keep his IV in place. I scooted up as close to his box as I could and peered in, marveling at my beautiful boy whose nose I thought looked familiar. "Hi Calvin," I said softly, and my baby boy opened his eyes for the first time; he was twenty-one hours old. This morning at four-thirty, on his fifteenth birthday, Calvin awoke to a grand mal seizure. He convulsed for over a minute. He bit his cheek and it bled. His breathing was labored and strident. Afterward, I crawled into his bed. There, I cupped his shoulder with one palm and laid the other on his hip; he rested one hand over my eyes and put his other around my neck. He slept. Tell me about despair, yours, and I will tell you mine. Meanwhile the world goes on. "Happy Birthing Day, Super Mama!" With a smile on my face and cleated rubber boots on my feet, I trudged home in the slush and sleet left from a mini ice storm that rolled through last evening. It reminded me of the morning Calvin was brought into world. In honor of Calvin's milestone, please consider a contribution to CURE epilepsy by clicking here.